Showtime 4pm doors open at 3pm.. Ticket price includes a 6% handling fee. ALL TICKETS ARE WILL CALL, TICKETS ARE NOT MAILED. Showtime 4pm doors open at 3pm. Ticket price includes a 6% handling fee. ALL TICKETS ARE WILL CALL, TICKETS ARE NOT MAILED. Robert was not able to do his annual Valentines Day show back in Feb. so we are presenting it a few months late ( better late then NEVER)!! 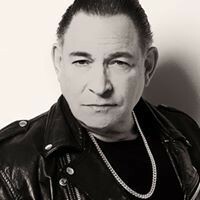 Appearing in the band with Robert will be English Guitarist Chris Spedding Robert Gordon has presented over 70 shows at the Turning Point and each one a real happening show. We love his music! Robert broke out with his hit "Red Hot" in 1977, knocking down disco queens, would-be punks, and new wave wannabes with his no-holds-barred take on hot-rodded rockabilly. Since then he has been like a turbo jet, and is often credited for lighting up the roots-rock revival and paving the way for real rock'n'rollers to find their niche among the overblown dance music and arena rock that dominated the airwaves. Robert's legacy has been fueled by his partnership with some of the greatest guitar players in history  Link Wray, Danny Gatton, and Chris Spedding. Robert first saw Link Wray at an amusement park in Glenn Echo Park, Maryland, in 1962, and knew he had to play with him. Together they recorded a successful string of records, which included the song "Fire," a gift from Bruce Springsteen. Although he is best known for being a tough-as-nails rockabilly artist, Robert is always quick to point out "I'm not trying to recreate something. This is how I feel."